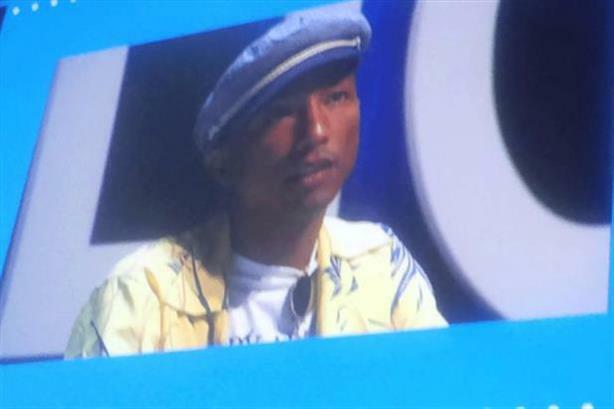 Intention is everything in the internet age and if you do not believe in what you are doing, millennials will "call you out in seconds", according to Pharrell Williams, the singer and producer. Williams was speaking to a packed auditorium at the Cannes Lions International Festival of Creativity today, where delegates queued for up to two hours to get the best seats for his interview with Ryan Seacrest, the American TV and radio presenter. When asked by Seacrest for advice for young creatives, Williams said: "Music is ubiquitous now and that’s beautiful but it means it’s important not just to be about sound. "Yes, you heard that but what did you feel? There must be a tactile, kinaesthetic value to it. You have to make sure that you write intention into [your music]. "Millennials can hear something and see right through it and say ‘they’re not real’. I love that because it raises the stakes. "Intention is everything. You know your mother's cooking because of what? Because of her intentions." When asked about holding people’s increasingly limited attention, Williams repeated his belief in creating content with "kinaesthetic value", adding that you must make sure "your intentions are pure in everything that you do". Williams was more relaxed about getting the right balance between creative and commercial. He said: "When you concentrate on creativity then that translates into commerciality." The artist, whose recent hits include Happy and Get Lucky, also spoke of his frustration with the music industry’s reluctance to back songs that sound unlike anything else in the charts. He said: "I feel bad about labels who say that the call-out [a process similar to market research] doesn’t work. But it’s no different from anything else…you just want the business to be up for hearing new sounds." When asked what other artists he thought showed authenticity, Williams named Adele, whose album, 21, is the biggest seller of the decade so far in the UK. Seacrest also asked Williams why he "always looks 27", to which the singer, who is 42, replied: "I would say my mom and my dad, but also my curiosity."